Amanda Fenwick was first elected to public office in May 2012, and is currently in her fourth term on city council. Shortly after being elected to city council, Fenwick was appointed to lead the hiring process for a new city administrator. She has been instrumental in the city’s annual budgeting process, developed the city’s public relations strategy and plan, and has instituted new a new form and process for appointing citizens to the city’s committees. She prioritizes listening to citizens to ensure the city is meeting the needs of the people it serves. Fenwick has served on the Clear Lake Shores Parks & Pool Committee, and is the city’s representative on the Houston-Galveston Area Council (H-GAC) and on the League City Regional Chamber of Commerce. She has been active with the city’s civic club, serving as past chair of the club’s scholarship committee, and as a volunteer in numerous other capacities. Fenwick has more than 15 years of marketing, public relations, event planning and leadership experience. She is vice president for marketing and public relations at San Jacinto College where she oversees a team of 12 that is responsible for all marketing, advertising, public and media relations, graphic and website design and content, and crisis communications for the college. 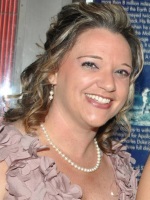 She serves as co-chair of the Houston-Galveston Regional PIO Network. Fenwick enjoys cooking, shopping, and spending time with family and friends. She and her husband Jay have one daughter.